Also known as convulsions, epileptic seizures, and if recurrent, epilepsy. It is a sudden alterations in normal brain activity that cause distinct changes in behavior and body function. They are thought to result from abnormal, recurrent, uncontrolled electric discharges of neurons in the brain. Pathophysiology of seizures is poorly understood but seems to be related to metabolic and electrochemical factors at the cellular level. Predisposing factors include head or brain trauma, tumors, cranial surgery, metabolic disorders (hypocalcemia, hypoglycemia or hyperglycemia, hyponatremia, anoxia); central nervous system infection; circulating disorders; drug toxicity; drug withdrawal states (alcohol, barbiturates); and congenital neurodegenerative disorders. Seizures are classified as partial or generalized by the origin of the seizure activity and associated clinical manifestations. Simple partial seizures – manifest motor, somatosensory, and psychomotor symptoms without impairment of consciousness. Complex partial seizures – manifest impairment of consciousness with or without simple partial symptoms. Generalized seizures – manifest a loss of consciousness with convulsive or nonconvulsive behaviors and include tonic-clonic, myoclonic, atonic, and absence seizures. Simple partial seizures can progress to complex partial seizures, and complex partial seizures can secondarily become generalized. Seizures affect all ages. Most cases of epilepsy are identified in childhood, and several seizure types are particular to children. The origin of 50-70% of all cases of epilepsy is unknown. Epilepsy sometimes is the result of trauma at birth. Such causes include insufficient oxygen to the brain; head injury; heavy bleeding or incompatibility between a woman’s blood and the blood of her newborn baby; and infection immediately before, after, or at the time of birth. head trauma resulting from a car accident, gunshot wound, or other injury. May be preceded by an aura such as a peculiar sensation or dizziness; then sudden onset of seizure with loss of consciousness. Rigid muscle contraction in tonic phase which clenched jaw and hands; eyes open with pupils dilated; lasts 30 to 60 seconds. Rhythmic, jerky contraction and relaxation of all muscles in clonic phase with incontinence and frothing at the lips; may bite tongue or cheek, lasts several minutes. Sleeping or dazed postictal state for up to several hours. Loss of contact with environment for 5 to 30 seconds. Appears to be day dreaming or may roll eyes, nod head, move hands, or smack lips. Resumes activity and is not aware of seizure. Seen in children or infants, caused by cerebral pathology, often with mental retardation. Infantile spasms usually disappear by age 4, but child may develop other types of seizures. Brief, sudden, forceful contractions of the muscles of the trunk, neck, and extremities. Extensor type – infant extends head, spreads arms out, bend body backward in “spread eagle” position. Mixed flexor and extensor types may occur in clusters or alternate. May cause children to drop or throw something. Infant may cry out, grunt, grimace, laugh, or appear fearful during an attack. Rhythmic twitching of muscle group, usually hand or face. May spread to involve entire limb, other extremities and face on that side, known as jacksonian seizure. Numbness and tingling in a part of the body. May also be visual, taste, auditory, or olfactory sensation. May be aura of abdominal discomfort or bad odor or taste. Auditory or visual hallucinations, déjà vu feeling, or sense of fear or anxiety. Repetitive purposeless movements (automatisms) may occur, such as picking at clothes, smacking lips, chewing, and grimacing. Complex partial seizures – begin as partial seizures and progress to impairment of consciousness or impaired consciousness at onset. 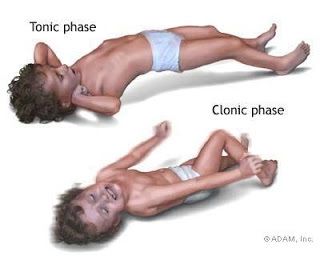 Generalized tonic-clonic seizure with fever over 101.8 degrees Fahrenheit. Occurs in children younger than age 5. Treatment is to decrease temperature, treat source of fever, and control seizure. Long-term treatment to prevent recurrent seizures with fever is controversial. EEG, with or without video monitoring, locates epileptic focus, spread, intensity, and duration, helps classify seizure type. CT scanning or MRI identifies lesion that may cause of seizure. Single photon emission CT scanning (SPECT) or positron emission tomography (PET) identifies seizure foci. Neuropsychological studies evaluate for behavioral disturbances. Serum electrolytes, glucose, and toxicity screen determine the cause of first seizure. Lumbar puncture and blood cultures may be necessary if fever is present. Loosen tight clothing, especially around the person’s neck. Stay with the person until he or she recovers, or until you have professional medical help. Meanwhile, monitor the person’s vital signs (pulse, rate of breathing). Antiepileptic drugs (AEDs) may be used singly or in combination to increase effectiveness, treat mixed seizure types, and reduce adverse effects. A wide variety of adverse reactions may occur, including hepatic and renal dysfunction, vision disturbances, drowsiness, ataxia, anemia, leukopenia, thrombocytopenia, psychotic symptoms, skin rash, stomach upset, and idiosyncratic reactions. Surgical treatment of brain tumor or hematoma may relieve seizures caused by these. Temporal lobectomy, extratemporal resection, corpus callosotomy, or hemispherectomy may be necessary in medically intractable seizure disorders. Monitor the entire seizure event, including prodromal signs, seizure behavior, and postictal state. Monitor complete blood count, urinalysis, and liver function studies for toxicity caused by medications. Provide safe environment by padding side rails and removing clutter. Place the bed in low position. Do not restrain the patient during seizure. Do not put anything in the patient’s mouth during seizure. Maintain a patent airway until the patient is fully awake after a seizure. Provide oxygen during the seizure if the patient become cyanotic. Place the patient on side during a seizure to prevent aspiration. Protect the patient’s head during the seizure. Teach stress reduction techniques that will fit into the patient’s lifestyle. Tell the patient to avoid alcohol because it interferes with metabolism of AEDs and adds to sedation. Encourage the patient to determine existence of triggering factors for seizures, such as skipped meals, lack of sleep, and emotional stress. Remind the family the importance of following medication regimen and maintaining regular laboratory testing, medical check ups, and visual examinations. Encourage patient to follow a moderate lifestyle routine, including exercise, mental activity, and nutritious diet. NSNA NCLEX-RN Review, 2000 ed. Verbalize understanding of factors that contribute to possibility of trauma and or suffocation and take steps to correct situation. Recognize need for assistance to prevent accidents or injuries.